The state’s sockeye runs are moving along. By this time we have enough data to make some pretty accurate conclusions about the how the run will turn out in the end. If you are planning on fishing for sockeye this year, be sure to check out the guide for some tips and tricks to put fish in your boat. Pre-season Lake Washington was pretty low, and the actual results much lower. Currently only 13k fish have gone through the Ballard Locks fish ladder. Take that number with a grain of salt, however, because the WDFW hasn’t update the web site in over a week. However any way you cut it the pre-season estimate of 39k looks far out of reach. This is significantly down from the 5 year and 10 year averages. 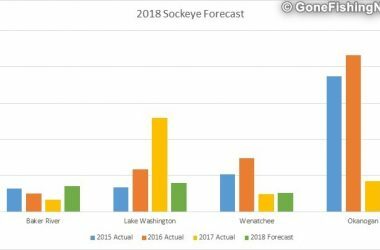 Even though we will likely have significantly more sockeye returning to Lake Washington than Baker Lake we will not get a fishery this year as the escapement goal is an astonishing 350k fish. It is surprising the escapement goal is that high. For example, Lake Wenatchee, which is a native and natural spawning run of fish, has a goal of 23k fish. So it is very surprising that the Lake Washington fish which aren’t native to the water body and are hatchery fish have such a high goal. Hopefully we’ll see a change for the goal so that other years have a better chance to have a fishery. The Baker run is looking like it will likely come in close to the pre-season estimates. 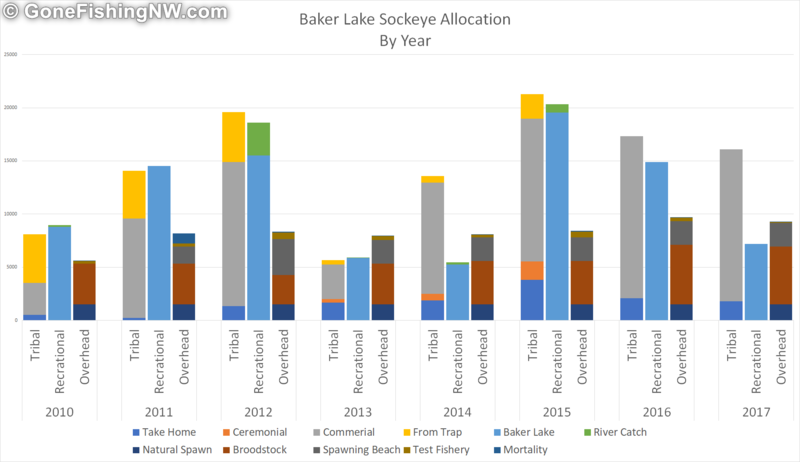 However due to increased hatchery shares, compared to the average for previous years, we aren’t seeing any many fish back to the lake yet. Fishing reports have been mixed for this extremely popular fishery. Tribal netting does happen in the river before the fish trap, so with a pre-season forecast of 35k we would expect to see about 22k after netting to make it to the trap. Right now, the total is at 8k to the trap. Unfortunately, the recreational fishery in the lake is the last in line to get fish after the tribes and hatchery, so only 4k have been sent to the lake. 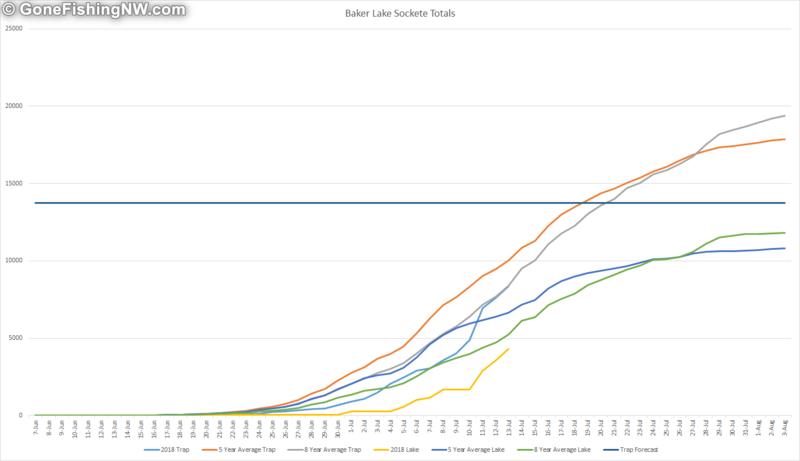 To learn more about how the Baker Run is allocated, check out Baker Lake By The Numbers. The Columbia is the road for two major sockeye returns – the Okanogan River run and the Wenatchee River run. The combined estimate is 98k fish, with about 73% of those headed for the Okanogan. 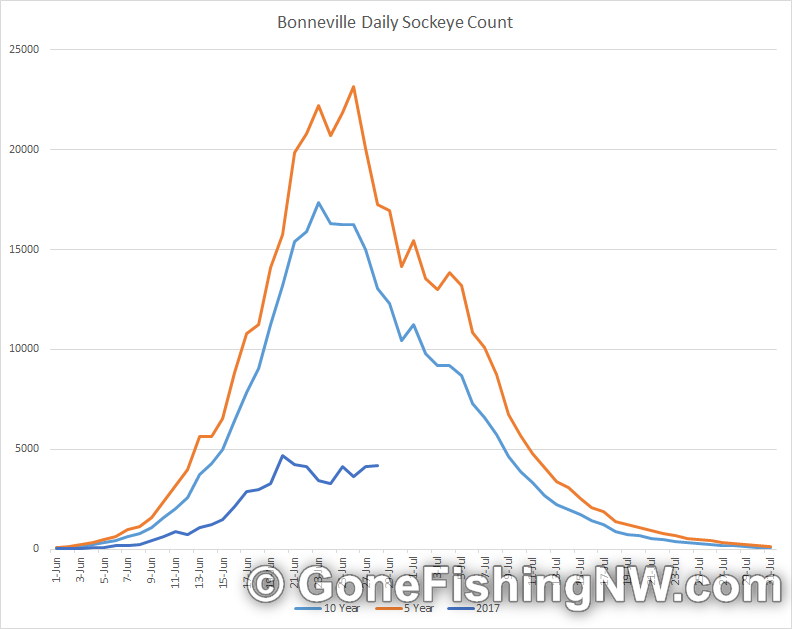 As of today about 186k sockeye have crossed Bonneville dam. This is significantly better than the forecast. 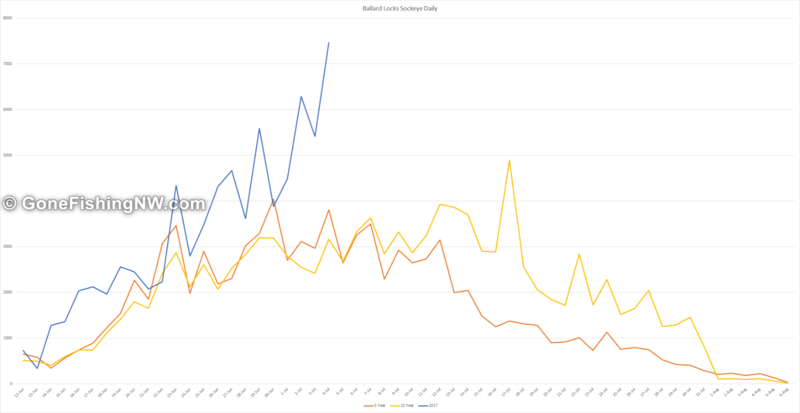 Daily counts are declining, with relatively few fish left expected. This has caused the WDFW to open the Columbia for sockeye fishing. Lake Wenatchee is not currently scheduled to open, and based on the numbers it is unlikely to. 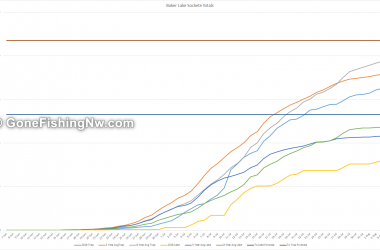 Historically this this time of year one can get a pretty good estimate on how many fish are bound for Lake Wenatchee by comparing the numbers at Rocky Ridge and Rock Island dams – which are the dams below and above the mouth of the Wenatchee river. Right now, that different is 12k fish. According to the WDFW’s website the escapement goal is 23k, which seems unlikely to be be met. However, they want a minimum number of harvestable fish before opening a fishery and that total comes to 27k. 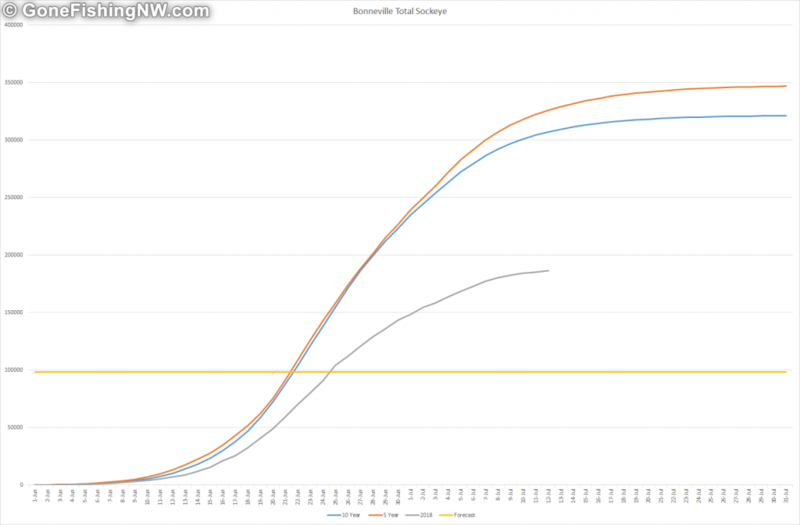 However there are still 62k fish between Bonneville dam and Rocky Ridge dam, so there is still a possibility. If we assume 30% of those are Wenatchee bound then that would be 18k, which would be the total to 30k – which just a bit more than we need to to open the fishery. So it seems possible, but unlikely, we’ll have a Wenatchee fishery this year. 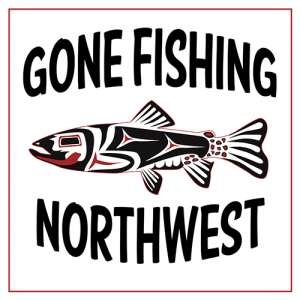 If you are interested in this fishery then I’d keep an eye on the Tumwater dam counts. This dam is actually on the Wenatchee river and will be the most accurate as to how many fish are headed to the lake. However, the counting is done off video tape, not live, so it can lag behind several days or even up to a week or more. If that number starts getting really close to 27k then one might expect a limited season to open. 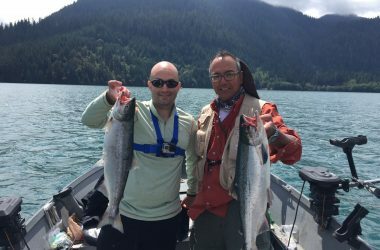 If you want to get out sockeye fishing this year the main stem Columbia at places like Wells Dam and Brewster pool are the best bets for limits. 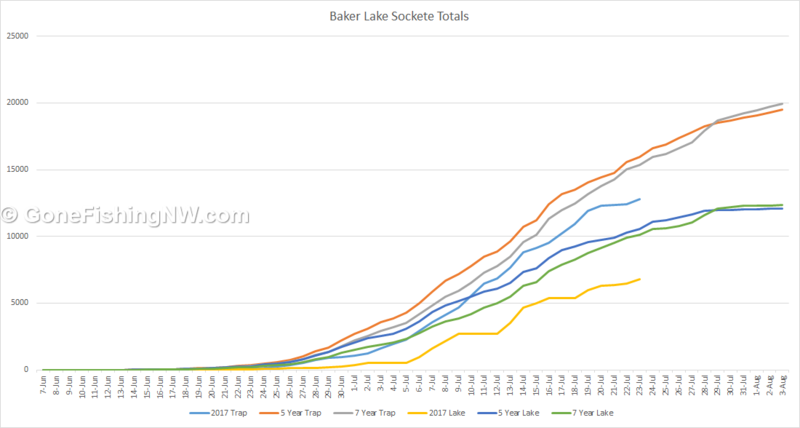 Baker Lake will likely be a 1 or 2 fish show for most people, with limits being rare. 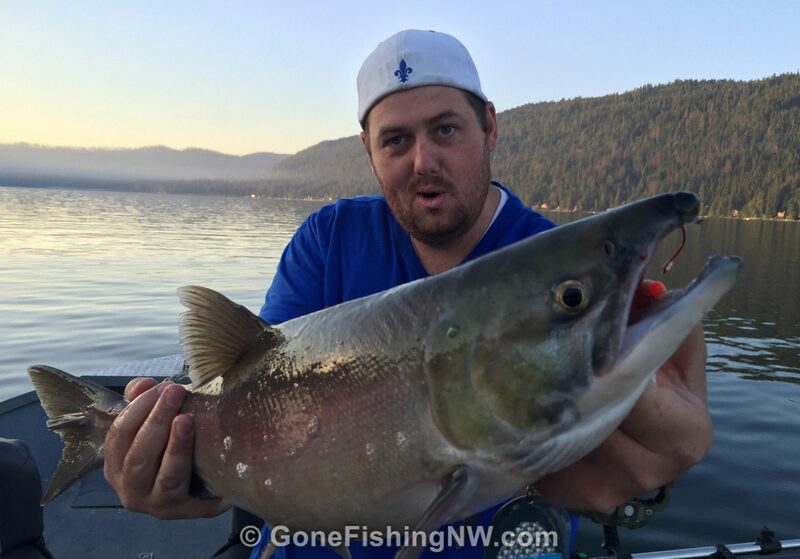 If you are planning on getting out make sure to check out our sockeye fishing tips. With the low numbers you’ll need every advantage you can get. What are your thoughts about sockeye and the state of the runs?